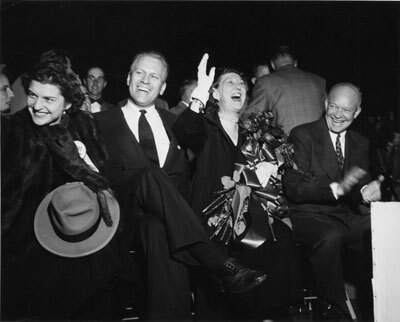 Description: Representative Gerald R. Ford and wife Betty attend a campaign event with presidential candidate General Dwight D. Eisenhower and his wife Mamie. Credit: Courtesy Gerald R. Ford Library/Grand Rapids History & Special Collections, Archives, Grand Rapids Public Library, Grand Rapids, MI. Rights Information: Robinson Studio copyrights are owned by the Grand Rapids Public Library. Permission has been given for continuous download and use -- no usage fees and no further permission required.